Well, we all are aware about Intelligence Voice Recognition Devices and ‘Alexa’ is one of them which is developed by Amazon and gives response as per user voice commands, capable of giving Responses on playing music, news, streaming podcasts, provides weather and traffic information and many more such as controlling Home Automation system. Amazon has many devices such as Amazon Alexa Echo (having wireless speaker), Amazon Alexa Echo Dot, Amazon Alexa Show Amazon Alexa Look and Amazon Echo Plus with which Amazon Alexa is Compatible. The main advantage of Alexa is that it supports English and German languages for its interaction and communication. Eventually, above these skills, one can also make their own Custom Skills in what manner they want like reading news feed, playing mantras and many more. 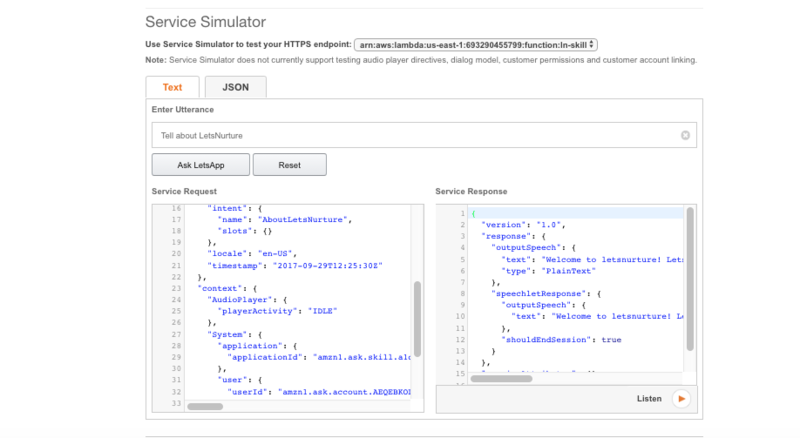 First and foremost, you need to sign in to AWS console lambda (a computer service which lets run our code in response to events) https://aws.amazon.com and amazon developer account( a platform where alexa skills are submitted.) https://developer.amazon.com . After selecting Alexa Skills Kit, a developer console will open with a list of your skills you have developed. If not, and if you want add a new Skill you can click on ‘Add a new Skill’ on the top right corner of the Developer Console screen. After adding on new Skill, now you need to start adding intents and invocation names, application ID for your skill and click Next. The invocation name describes what you will call after booting of your alexa or to identify your own particular skill and the name will appear on your alexa app which you have connected with your device. Note: Alexa device needs to configure with your alexa device, otherwise your device would not boot/start. Amazon has given access to download alexa app only in countries like European Countries. They would not allow to download Alexa app in India. Give its Sample Utterances (what user would call/request for your skill) and after finishing it Go to next Step-> Configuration. After Selecting Lambda, a list of lambda functions will appear for your new skill. On the top right place, click on Create Function and then you have to select blueprint which meets your skill requirements. 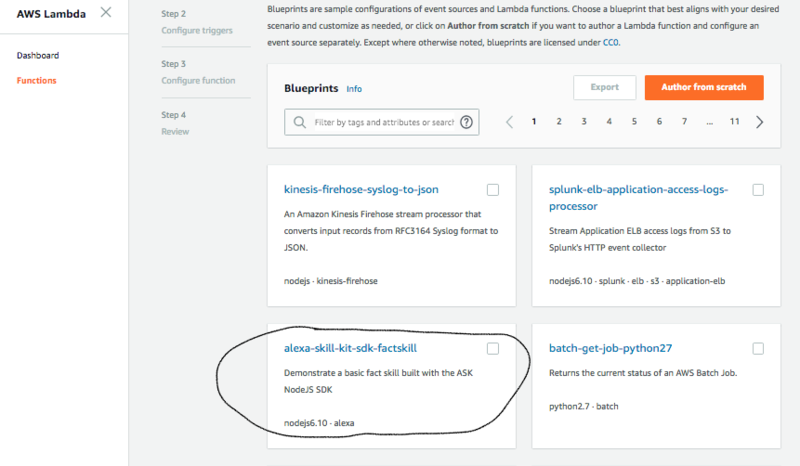 For Rss Feed and mostly, ‘alexa-skillkit-fact-sdk-factskill’ is used so click alexa-skillkit-fact-sdk-factskill in Blueprint and click Next. Now Add Trigger as Alexa Skills Kit and after adding a Trigger you will need to add Function name, and add Runtime Language. Remember, To develop skills in alexa, it supports python, java , c# and node.js language. So, select your Runtime language. Then add/upload your code in zip file. Note: If you are using Node.js, please zip only your source files in root directory which includes index.js rather to zip your root directory and then Select your role as lambda-existing-execution role and create Function, after creation of successful Function it will give you ARN. 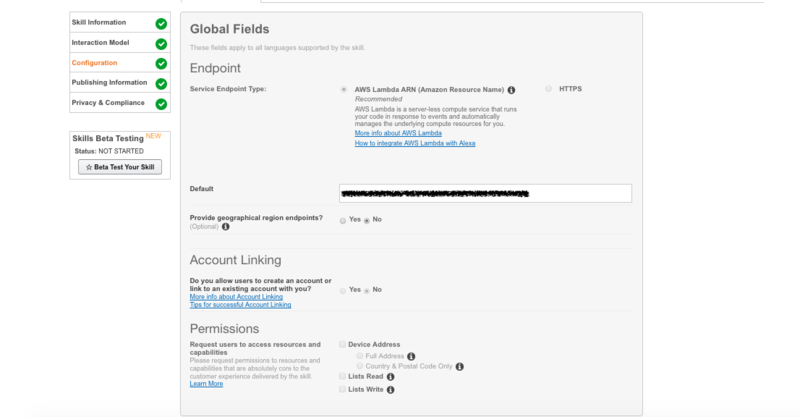 The ARN which is created in AWS is needed to add in Default of developer console. And click Next. Thus, it is created. To test your Skill, type intent in Test Screen and thus it will give you response, if there is no error in your skill. That’s it, Your Custom Rss Feed is Ready. Enjoy! And build your Custom Skill in Alexa which enliven Users to use your Skill.